This tokcha has a very smooth rear surface and thus appears to have been worn on the body; the front is decorated in very low relief. Its single upper retaining loop is centred between two duck heads, with the roundel emerging from the ducks' beaks. The border of the roundel is marked with short diagonal incisions. Four further loops appear on its lower edge; there has been no apparent breakage here. Possibly the roundel was designed as part of a set of horse trappings, where leather ties would have been passed through the loops to secure it, along with other medallions or elements of the trappings. The central animal is a curiosity. It is represented in profile, but all four legs are shown. Although it has been initially identified as a lion, this is not certain. The head has a pointed jaw, possibly like a dog or a jackal, and a short neck. Instead of a mane, there is a crescent shape behind the head which could possibly be a horn, or perhaps the long flap of an ear. At the top of the head, it appears that there is either a short pointed horn or else an ear. The hindquarters are extremely thin and the articulation of the hind-legs is emphasized. While the forefeet appear to have paws, the hind-feet display three elements which might be claws. 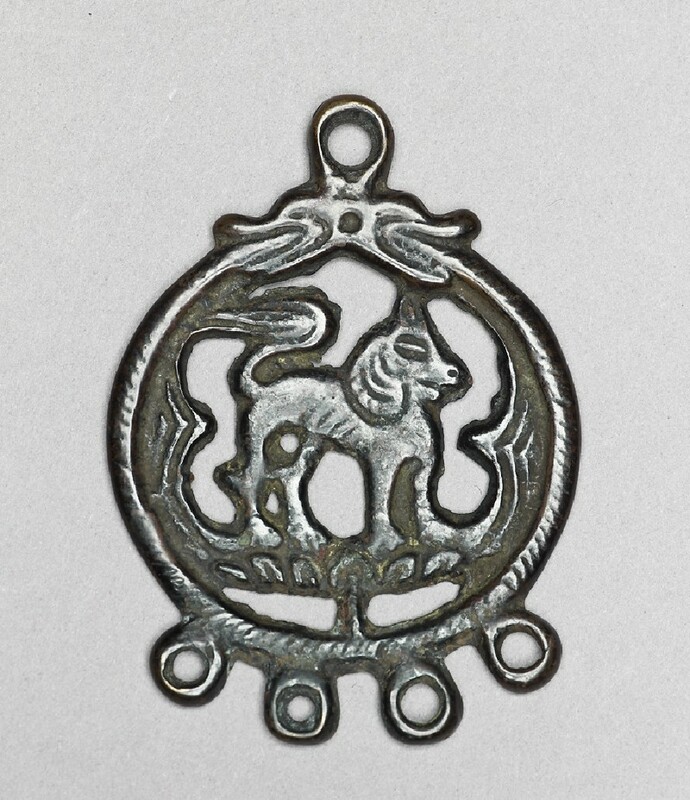 The tail is long and full, recalling early Tibetan representations of lion tails. The Tibetan penchant for hybrid creatures during the dynastic period is well documented . Here it appears that the creature combines avian hind-legs and claws, paws on the forefeet, a lion's tail, and the head of jackal or dog. 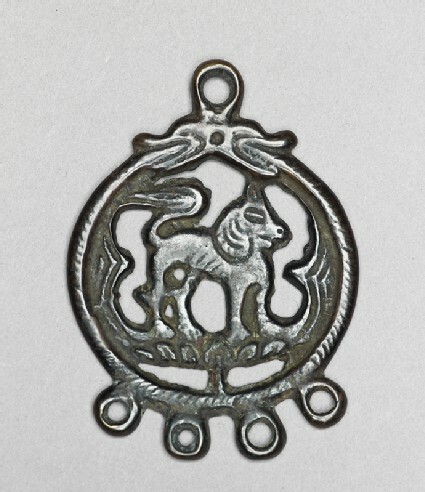 This hybrid combination may be compared with the seal of a Tibetan document of the late eighth to early ninth century, recovered at Dunhuang. When first studied, the imprint of this animal seal was erroneously interpreted as a winged lion emblem . In fact it is a hybrid: the animal has a dog or jackal head, wings, and a lion's body, legs and tail. Such hybrid animals appear to be Tibetan variations on the fantastic cre a t u re s found in the Central Asian and Chinese repertoires. 1 Carter, 'Three Silver Vessels from Tibet's Earliest Historical Period: A Preliminary Study'. 2 Heller, Tibetan Art, fig. 12: seal on a Tibetan document in the Bibliotheque Nationale, Paris, PT 1083.